Do you keep your partner up with your snoring? Are you drowsy during the day because you can’t get a good night’s sleep? Your snoring may be more than just irritating. You may have sleep apnea, a common condition in which your breathing is interrupted during sleep. Affecting more than 18 million adults, sleep apnea can stop breathing anywhere from several seconds to a minute and can occur up to 30 times an hour. If the idea of your breathing stopping for up to a minute sounds scary or dangerous, it should. Sleep apnea can range from mild to severe — and when it’s severe, the effects on your health can be severe as well. That’s why it’s important to discuss your concerns about sleep apnea and snoring with the dental team at My Ashburn Dentist in Ashburn, Virginia. They are experts at diagnosing and treating sleep apnea so that you can get a good night’s sleep. The most common type of sleep apnea is obstructive sleep apnea, which is caused by your throat muscles relaxing and narrowing your airways. When your airway is obstructed, or closed off, your brain kicks in and wakes you up so you can breathe. This brief sleep arousal can happen up to 300 times a night! The team at My Ashburn Dentist can diagnose your condition based on a physical exam, a description of your symptoms, and a sleep study, in which your oxygen levels and heart rate are measured while you sleep. CPAP is a breathing device that pumps air into your mouth and nostrils to keep your airways open while you sleep. To use this device, you place a mask over your nose and mouth while you sleep to allow the device to push air into your airway. An oral appliance such as the Silent Nite® system helps position your jaw to change the shape of your airway, making it easier for air to flow from your lungs through your mouth. It reduces snoring and sleep apnea complications. For severe cases of sleep apnea, when other treatments have failed, surgery to remove any obstruction and enlarge your airway is an option. 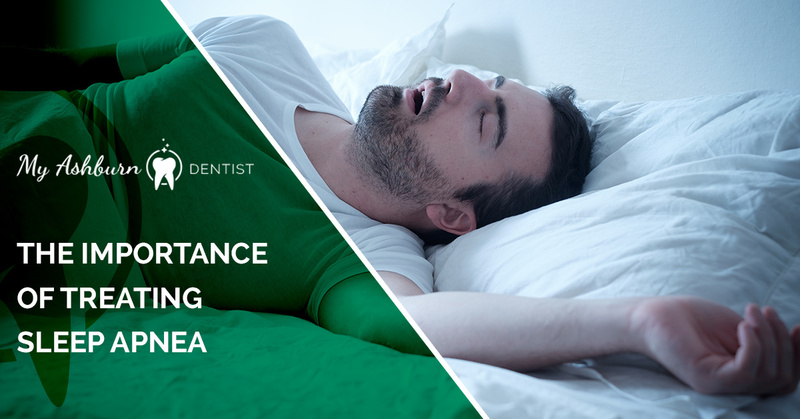 If your snoring is keeping you and your partner awake, call My Ashburn Dentist or make an appointment online to find out about sleep apnea and snoring treatments.